Some celebrations call for a birthday cake hat!! Or a party hat cake, whatever you want to call it. 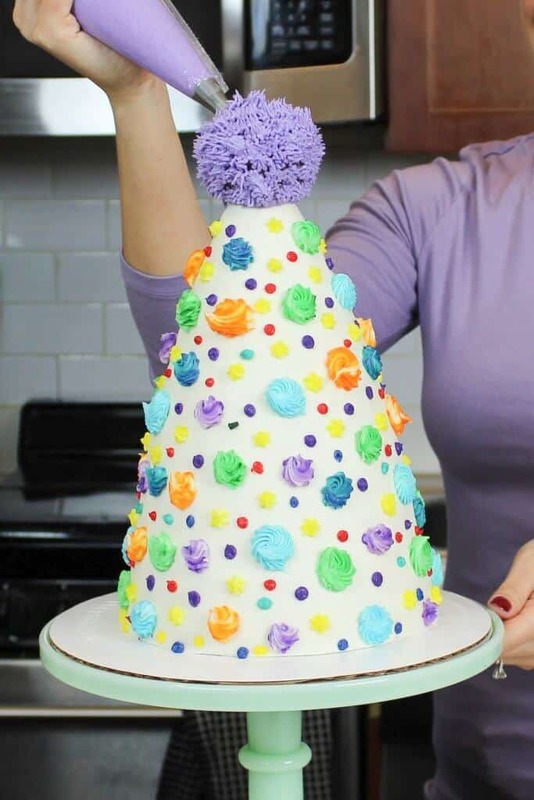 Alisha Henderson inspired me to make this cake with her adorable floral party hat cake. When I quit my corporate job, I had a get together with my friends to celebrate my career change. I wanted to make a special cake to celebrate the commencement of all things Chelsweets. I used my favorite flavors and recipes to make this cake. After all, this cake was for my own party!! I’m a huge fan of chocolate cake, so it’s no surprise I used my go-to chocolate layer cake recipe. It has an amazing taste, but also has amazing structure! It can stand up to being stacked sky high, and carved with a serrated knife. This cake is made with a bunch of different sized cake layers. They range in size from 7 to 2 inches. I used a circle cutter to create the tiny 2 inch cake layer that the cake is topped with. 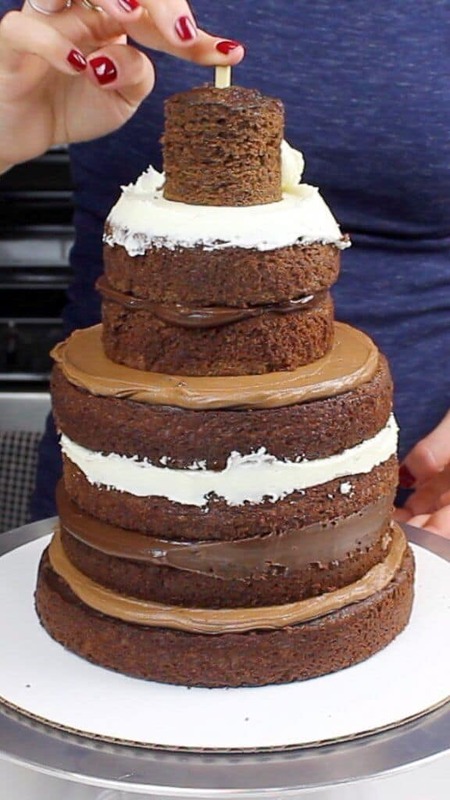 The cake layers are stacked in a tall, cone-like shape. I started with the largest layer at the base, and worked my way up to my smallest cake layer. The main benefit of creating this shape is that you don’t necessarily have to carve the cake! You can added extra buttercream around the layers, to create smooth sides. If desired, you can use a serrated knife to even out the sides bit!! I chose to trim the cake layers a smidge, to make it easier to create a party hat shape. 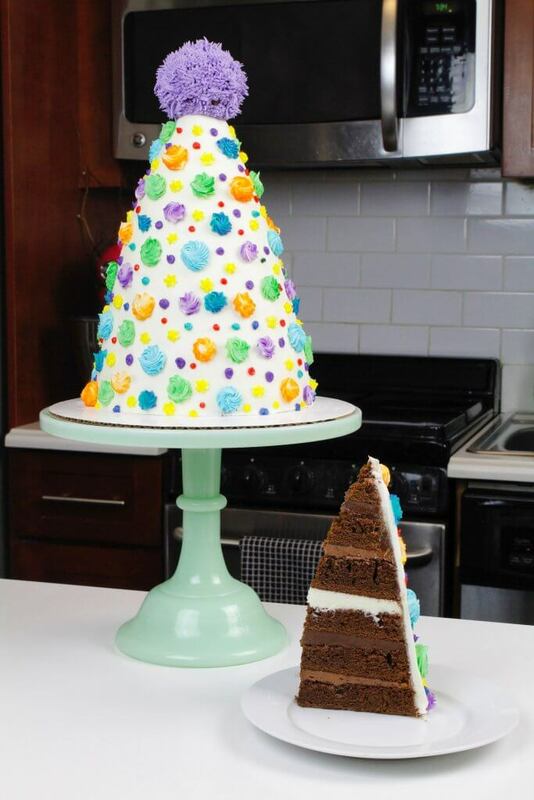 This party hat cake is made with seven cake layers, which can be a challenge to stack and frost. I inserted a wooden dowel into the center once the cake layers were stacked. This gives the cake stability, and makes it way easier to frost! The dowel also keeps the layers in place as the cake is decorated. If this step is skipped, the cake can end up lopsided, or even topple over!! Speaking of keeping this cake upright and level, the buttercream acts as a mortar in this cake! It keeps everything in place. It also tastes delicious with the chocolate cake layers!! I decided to simplify this recipe by filling the cake with just vanilla buttercream. If you really want to use multiple fillings in this cake, you can make a half batch of my chocolate buttercream recipe. However, I’m sure you’ll notice this party hat cake has three different fillings! It uses a milk chocolate ganache, chocolate buttercream, and vanilla buttercream. Whenever I can, I try to save leftover frosting and repurpose it in the future. I was able to use some leftover chocolate buttercream and ganache from prior baking projects to fill this cake. Making three different fillings for a cake from scratch takes FOREVER! If you don’t already have other cake fillings on hand, I highly recommend just filling the cake with vanilla frosting. While on the topic of how tall and large this cake is, I want to discuss the number of people it feeds! This always varies based on what you consider a proper sized “slice,” which could be rather generous for a teenage boys birthday party. On the other hand, whenever there’s an office birthday, I feel like people ask for microscopic-sized slices. In my opinion, this cake feeds 20-25 people with moderately sized slices. Prepare the cake and buttercream recipes as instructed below. Mix 1 cup of crumbled cake tops with 1/3 cup of frosting, and place the mixture on a piece of plastic wrap. Form the mixture into the shape of a ball, and place in the freezer to firm up. This will be the top of the party hat! Insert a wooden dowel through the center of the cake layers, leaving about 1 inch exposed on the top. 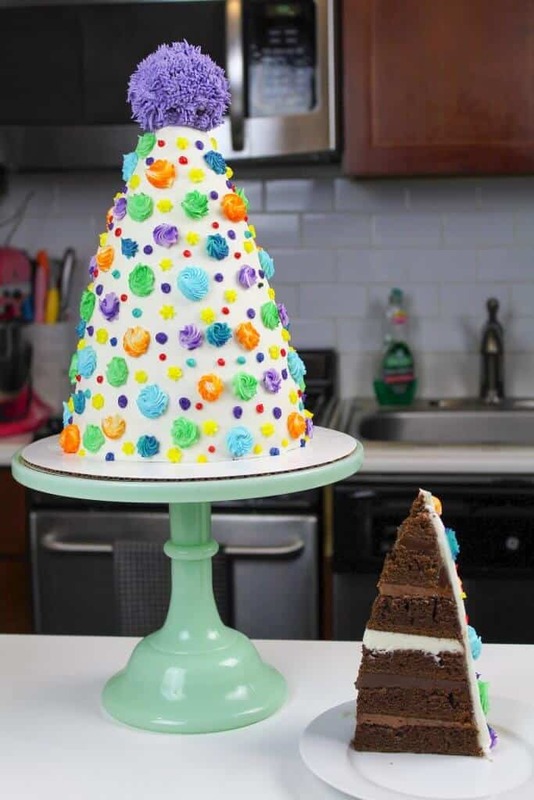 If desired, use a serrated knife to trim the cake layers into the shape of a tall cone. Smooth a thin layer of frosting onto the cake using a bench scraper. Chill in the fridge of freezer for 10 minutes, until the frosting is firm to the touch. Add a second, thicker layer of frosting to the cake, and smooth using a bench scraper and an acetate sheet. Place the frozen cake ball on top of the wooden dowel. Color the remaining frosting a variety of colors using gel food coloring, and fill piping bags fitted with assorted piping tips. Place some of the colored buttercream in a bag fitted with a grass tip, and pipe buttercream onto the cake ball on top of the cake. Pipe colorful swirls and dots around the cake, and enjoy! 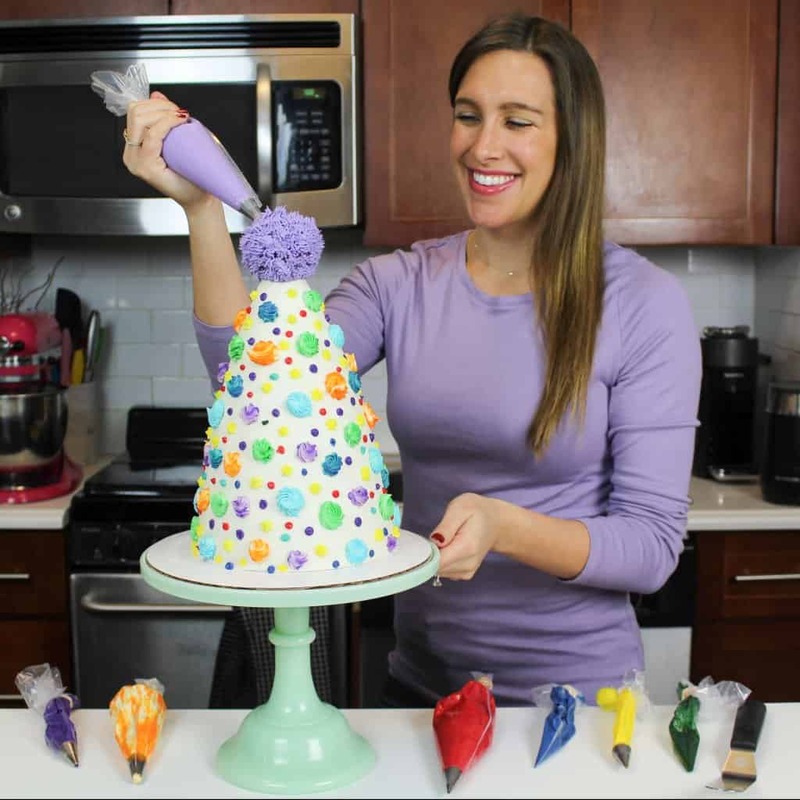 If you try this birthday hat cake recipe, please tag me @chelsweets, and use the #chelsweets so that I can see your amazing creations! Looking for the perfect cake for a special celebration?? This party hat cake is it! It's made with layers of chocolate cake and decorated with buttercream frosting!! Divide between the prepared pans, filling them about 1 inch high with batter. Bake for 30-35 minutes, or until a toothpick comes out clean. The four inch and six inch pans should be fully baked after about 30 minutes, while the seven inch pan will take a few minutes longer to fully bake. Use a serrated knife to level the tops of the layers. Use a 2 inch circle cutter to make a 2 inch cake layer with one of the four inch cake layers. Set the cake layers aside. Wait to color any of the buttercream until the cake is fully frosted. Begin with the seven inch cake layer. Cover with an even layer of buttercream. Repeat with the six inch cake layers, the two four inch cake layers, and top with the 2 inch layer. Add a second, thicker layer of frosting to the cake, and smooth using a bench scraper and an acetate sheet. Place the frozen cake ball on top of the wooden dowel. Chelsea…… this cake is ADORABLE!! I love it!! I can’t wait to make one!! I love all of your creations!! I am going to try a smaller version. I’ll send you a picture. aw thanks Debbie! You’re too sweet 🙂 and please do!!! I’d love to see it! In order to carve this cake into the party hat shape I’m guessing you have to carve a lot of cake from the largest bottom layer and less as you reach to the top. Could you use a smaller size cake pan for the bottom so there isn’t a lot of waste or would that create a balance problem to support the hat cake? It’s a very fun cake design! !